Winning a gold bracelet at the World Series of Poker is supposed to be difficult. It’s supposed to be a crowning achievement in the course of every poker player’s life. Victory is supposed to be an exhaustive collapse over the finish line. 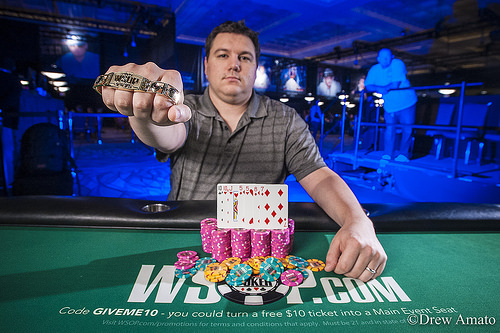 For Shaun Deeb, he made winning a gold bracelet look like child’s play. In one of the quickest Seven-Card Stud final tables in memory, the Upstate New York poker pro had everything go his way from start to finish, in what ended up as his second WSOP victory. Deeb won his latest victory by coming out on top at a final table which included several notable achievers. Six of the top eight finalists were previous gold bracelet winners. Deeb was characteristically modest on his reflections right after the win. The ultimate moment of triumph came when Deeb was heads-up versus Adam Friedman, then won five straight hands, and scooped the final pot of the tournament in a manner that left everyone scurrying for position to try and figure out what had just happened, so quickly. With this win, Deeb adds to his title list which includes a win in last year’s $10K Pot-Limit Omaha Championship. He’s now close to $1.3 million in WSOP earnings in 35 cashes. Deeb’s accomplishments in other tournaments and side action accounts for a considerably more sizable fortune. Deeb also owns three World Championship of Online Poker (WCOOP) titles. This tourney attracted a modest-sized field of 331 entrants which created a prize pool totaling $446,850. The top 50 finishers collected prize money. Second Place: Adam Friedman, from Gahanna, OH finished as the runner up. Friedman, who cashed for the 18th time at the series, won his gold bracelet at the 2012 series. He was paid $68,666. Side Note: Friedman is one of the few players who has WSOP cashes as follows: 1st, 2nd, 3rd, 4th, 5th, 6th, 7th, and 8th. Third Place: Max Pescatori, a.k.a. 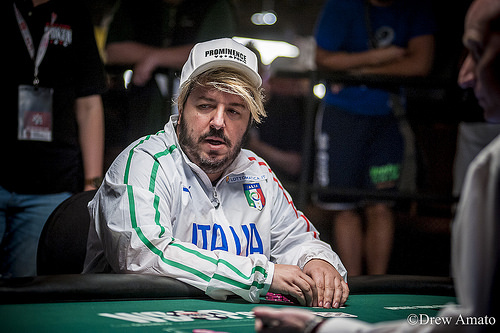 “the Italian Pirate,” originally from Milan, Italy and now residing in Las Vegas, was aiming for a fifth WSOP title, after winning two gold bracelets last year. He also made his second final table in 2016. However, this experience turned out to be a mixed blessing, coming in third but also receiving another nice payout, totaling $46,312. This was Pescatori’s 59th time to cash at the WSOP. Fourth Place: Katherine Fleck, from Ft. Meyers, FL was a delight to have at the final table, which was her first time to make the money at the WSOP. Prior to the start, Fleck was beaming with joy just to be at the table among such a notable lineup. However, she also played marvelously well, particularly for a first-time appearance at a final table. Fleck earned a well-deserved $31,899 and went away with quite a story, and some fine memories. Fifth Place: Eugene Katchalov, from Kiev, Ukraine, is a former gold bracelet winner who posted his best finish in three years. He now has 37 in-the-money finishes at the WSOP. Katchalov pocketed $22,448. Sixth Place: Yaniv Birman, from Westwood, CA came in sixth place. He collected $16,147 in what was his first time to cash at the WSOP in five years. Seventh Place: John Monette, from Palmdale, CA, was aiming for what might have been a third gold bracelet. This was his third final table appearance of this year’s series after coming in 2nd and 3rd previously. 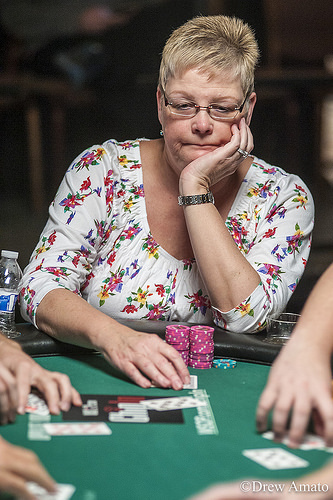 Monnette has now finished in-the-money 47 times at the WSOP and has accumulated nearly $1.8 million in earnings. Seventh place paid $11,878. 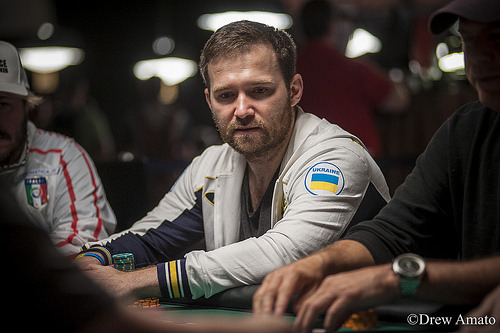 Eighth Place: Cory Zeidman, from Coral Springs, FL and a gold bracelet winner back in 2012 rounded out the final table as the eighth-place finisher. He received $8,941. This was the 49th official event on this year’s schedule. This leaves only 20 gold bracelet events still to be played at the 2016 WSOP. Shaun Deeb brings it in, Adam Friedman completes, and Deeb two-bets. Friedman calls. On fourth street, Friedman checks, Deeb bets, Friedman raises, Deeb three-bets and they get it all in. Friedman shows for a pair of queens and Deeb has for a pair of tens. Nobody improves until seventh street, where Deeb hits for two pair, meaning that Friedman needs to make a higher two pair. Unfortunately for Friedman, he can only find , which confirms that Shaun Deeb is the winner of Event #49: $1,500 Seven Card Stud, taking home $111,101 and the WSOP gold bracelet. 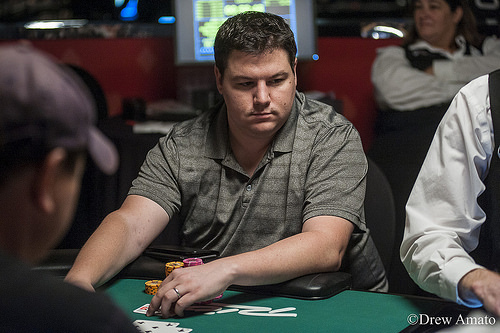 Adam Friedman completes, Shaun Deeb raises and Friedman calls. On fourth street, Friedman checks, Deeb bets and Friedman raises. Deeb calls. On fifth street, Friedman bets, Deeb raises and Friedman then makes it three bets, Deeb calls. Deeb bets sixth street with a pair of fours showing and Friedman calls. Deeb bets again seventh street and Friedman calls. Deeb rolls over for a full house and reduces Friedman to less than five big bets. Adam Friedman brings it in, and Shaun Deeb completes. Friedman raises, and Deeb three-bets. Friedman calls. On every remaining street Deeb has the lead and bets. Friedman calls all streets. Deeb shows for a pair of sevens and Friedman mucks his cards. Shaun Deeb completes three times in a row and Adam Friedman folds. Then, Deeb completes with a nine and Friedman calls. On fourth street, Deeb checks, Friedman bets and Deeb check-raises. Friedman calls. On fifth street, Deeb gets an ace and bets, Friedman calls. On sixth street, Deeb pairs his ace and bets, Friedman calls with a pair of fives. Both players check seventh street and Friedman asks, "You got it?" Deeb nods and rolls over for aces and nines. Players have taken a short, unscheduled break. Adam Friedman brings it in showing . Max Pescatori completes and Shaun Deeb makes it two bets. Friedman folds and Pescatori calls. On fourth street Pescatori check-calls one bet from Deeb. On fifth street Deeb takes the lead and bets. Pescatori makes it two bets all in and Deeb calls. Deeb shows for trip sevens and Pescatori can only show for a pair of threes. On sixth street Pescatori does not improve and is drawing dead. Deeb hits on the river to improve to a full house while Pescatori hits for two pair, but is already on the rail. Three-handed play starts very tight, only two hands head to fourth street and Adam Friedman wins both to scrape above one million. Then, Friedman completes with a king and Max Pescatori raises with a six. "How much did you start with?" Friedman asks and Pescatori replies, "230,000 preflop, probably 460,000 after the hand." Friedman calls. Friedman bets fourth street and Pescatori calls. On fifth street, Friedman bets and Pescatori raises. Friedman folds, giving the pot to Pescatori. Katherine Fleck open completes, leaving 13,000 behind. Shaun Deeb raises, Adam Friedman folds, and Max Pescatori three-bets. Fleck calls all in and Deeb also calls. On fourth street Deeb checks, Pescatori bets and Deeb calls. On fifth street Deeb checks, Pescatori bets all in for 35,000 and Deeb calls. Pescatori has for a pair of sixes and a gutshot straight draw. Fleck has for three eights, and Deeb only shows . On sixth street Pescatori improves to three sixes, while Deeb improves to a gutshot straight flush draw. On seventh street Pescatori gets for a full house, and Fleck can only show . Deeb picks all his cards up and they end up in the muck, conceding both pots to Pescatori, and eliminating Fleck. While Shaun Deeb and Adam Friedman were trading chips, both other short stacks waited for a spot to get their chips in. Max Pescatori has the bring in with a five and Katherine Fleck completes with a king, Pescatori calls. On fourth street, Fleck bets and Pescatori raises, Fleck calls. Fleck bets fifth street with an ace and Pescatori calls all in for his last 5,000. Pescatori turns over for nines and fives, Fleck has for a pair of queens and plenty of outs to improve. Fleck picks up the on sixth and the on seventh, which don't change anything. Pescatori ends the hand with the on sixth and the on seventh. Adam Friedman completes with a seven, Max Pescatori raises with an eight and action is on Katherine Fleck. She has the showing, checks over to the other side of the table, then folds. Friedman calls. Both players check through on fourth street. Pescatori gets an ace on fifth street and bets, Friedman calls. The sixth street goes check, check. Pescatori checks seventh street, Friedman bets and Pescatori folds. One hand after losing the big pot to Shaun Deeb, Eugene Katchalov completes with a king and Deeb raises with a six. Katchalov calls all in and they turn over the cards. Deeb shows for a pair of sixes, Katchalov has for a king-ten. Katchalov fails to improve on any of the streets and peels the insignificant . Deeb gets the on seventh and remains in the lead with a pair of sixes to win the pot. Adam Friedman brings it in with the . Eugene Katchalov completes and Shaun Deeb raises. Action folds back to Katchalov and he calls. On fourth street Katchalov bets and Deeb calls. The same action occurs on fifth street. On sixth street Katchalov bets, only for Deeb to raise. Katchalov then three-bets and Deeb calls. On seventh street Katchalov bets and Deeb calls before the cards are dealt. Katchalov shows and Deeb says, "You have to improve," showing as his three hole cards to give him a straight. Katchalov can only find on the river, sending the pot to Deeb and leaving him with 35,000 in chips. 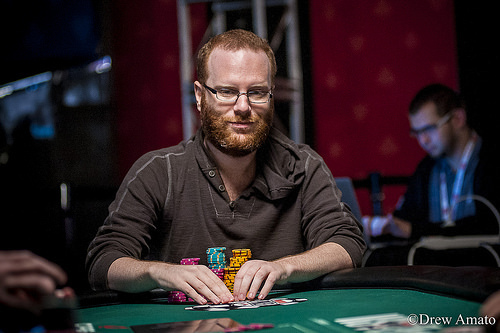 Adam Friedman completes with a ten and Max Pescatori raises, Friedman calls. Pescatori bets fourth street and Friedman calls. On fifth street, Friedman pairs his ten and bets, Pescatori quickly folds. Eugene Katchalov brings in and Shaun Deeb completes. Action folds back to Katchalov and he calls. On fourth street Deeb bets and Katchalov calls. On fifth street Deeb bets and Katchalov raises all in for 77,000 total. Deeb calls and shows for a pair of sixes and a flush draw. Katchalov can only show for a pair of fours. Neither player improves on sixth street and on seventh street, Deeb flips and says to Katchalov that any pair is good. Katchalov squeezes and finds to improve to two pair, fours and threes, and doubles up. Max Pescatori has the bring in with a four, Shaun Deeb completes with an ace and Pescatori calls. On fourth street, Deeb bets and Pescatori calls. Deeb then pairs his eight on fifth street and bets, Pescatori folds. Adam Friedman completes with a nine, Max Pescatori raises with a queen and Friedman calls. Pescatori bets fourth street and Friedman calls. Pescatori bets again fifth street and Friedman calls. The sixth street goes check, check. On seventh street, Pescatori bets again and Friedman calls. Both players briefly show their cards and Pescatori is caught bluffing with queen-high. Friedman only has another jack in his down cards and wins the pot with a pair of jacks.